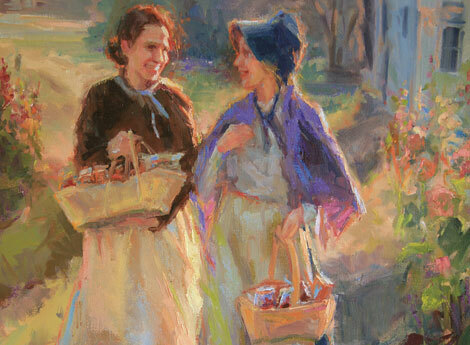 Prior to the Church calling women on full-time missions, what provided meaning for the Sisters of the Church? If the United Order was an attempt to revitalize the spirit of the law of consecration, then the canonization of section 110 into the 1876 edition of the Doctrine and Covenants likewise greatly furthered the cause of temple work in the minds of the Mormon faithful. . . . Though referred to in modern discourse as the scriptural cornerstone of temple work, prior to 1876 this revelation was virtually unknown. In a remarkably candid new thesis, Trevor Anderson has shown that Joseph Smith never directly referenced it in any of his later sermons. Neither, apparently, did Brigham Young or his counselors for most of his presidency. In fact, it was not published until November 1852 in the Deseret News by direction of Willard Richards. What led to its canonization in 1880 is not yet entirely clear, but Orson Pratt, a member of the original Quorum of the Twelve formed in 1835, was the driving force in its preservation and eventual canonization. . . .
Orson Pratt may well have been the first General Authority to publicly sermonize on the vision of Moses, Elias, and Elijah in August 1859. As Anderson notes, at Brigham Young’s death in August 1877, Pratt was in England overseeing the printing of the Book of Mormon on new electrotype plates. With the consent of John Taylor, then president of the Quorum of the Twelve, Pratt printed the Doctrine and Covenants using the same latest technology. Taylor recommended the inclusion of cross references and explanatory notes and during their communication agreed to include several new sections heretofore not incorporated. These included not only sections 109 and 110 with their emphasis on the Kirtland Temple, but also sections 2, 121-23, 132, and other temple-related revelations. This new 1876 edition was finally ratified by conference vote in October 1880. “Which is the Wisest Course,” The Transformation in Mormon Temple Consciousness, 1870-1898. Richard E. Bennett, BYU Studies Vol. 52, No. 2, 2013, 17-18.